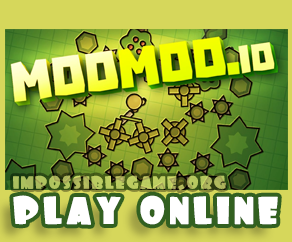 MooMoo.io is a newly released game that gains huge popularity these days. Playing moomoo is super challenging and exciting because comparing to other games you can develop your character as well as your village. Starting the game you should hit the trees around you and collect stoned and woods, getting resources you can build a village. With using gained resources you can build walls as well and defend your resources and windmills (windmill is used to get points). Comparing to other .io games MooMoo.io is a game where you have lots of different kind of opportunities to level up, to choose your way to be in attack mode, to be a farmer, defender & etc. BUT REMEMBER, as soon as you see your online opponents, find a way to attack them in smart way, or just run if you decide you can’t fight them. Developers of this game are Sidney De Vries, they have become a very popular game developers as it becomes super popular. Space/Mouse Click to hit enemies or gather resources.